If instead you prefer to purchase online, there are many good merchants out there. As a data point, the PeakProsperity.com audience has reported good experiences with GoldSilver.comand with APMEX. 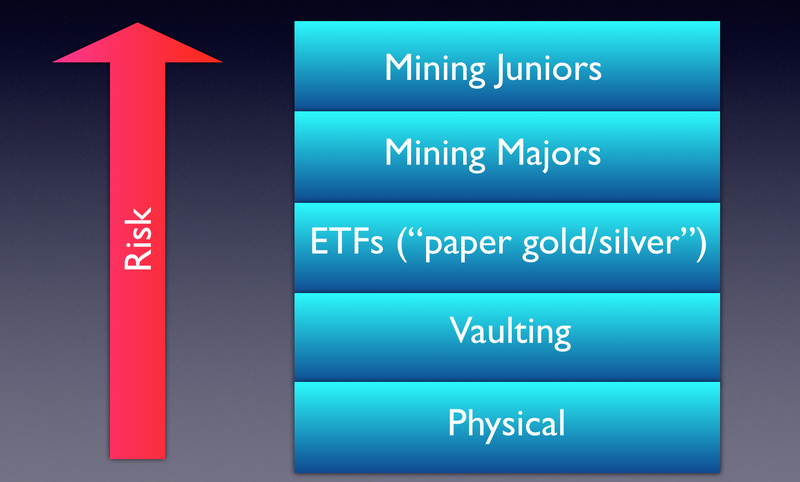 The most heavily traded ETFs/ETNs are GLD and SLV, which are heavily stacked with futures contracts. For folks looking for funds fully-backed by bullion, Sprott offers PHYS(gold), PSLV (silver), and CEF (both); and VanEck Merk Gold Trust offers OUNZ, which has the additional option of converting your stake to physical bullion which it will ship to you upon demand. The answer lies in clearly understanding your current financial situation, your future goals and needs and your risk tolerance. This is why we�re so adamant in encouraging investors to make the decision in partnership with their professional financial adviser (hopefully, one that doesn't sneer at the mere thought of owning a little gold! ).